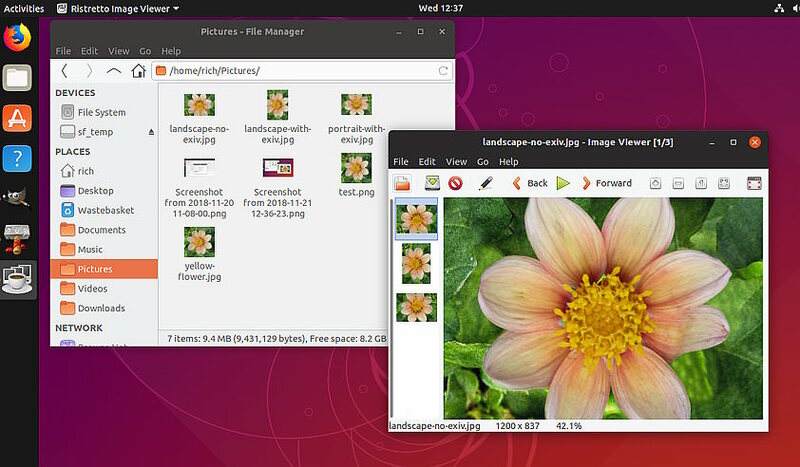 After exporting a landscape jpg image the thumbnail appears as portrait in the file manager (Thunar 1.8.1) and the image viewer (ristretto 0.8.3). However, the image viewer displays the image correctly. Ubuntu Studio 18.10 Gimp 2.10. Any help appreciated. Was this originally an image in portrait mode, then rotated 90⁰ ? It is probably the exiv data but might be the thumbnail causing the viewer issue. The image was shot in landscape mode processed from raw in Darktable after which the thumbnail is still correct then modified in GIMP after which the thumbnail has flipped to portrait. The image still display correctly in Ristretto image viewer. Puzzling. When you look only at the pixel data, the image from a camera is always in landscape mode. The EXIF orientation field specifies which of its four corners is actually the top-left one. When you edit a portrait image(*), the image is rotated on load, and saved as a portrait image, while the orientation field is reset to indicate the top-left corner as the actual top-left (no rotation). Normally Gimp does the right thing with the EXIF orientation when saving.